We love a good wedge, and we love womens shoes that are very modern, so of course we had to highlight the Tsubo Ovid Combo Wedges. 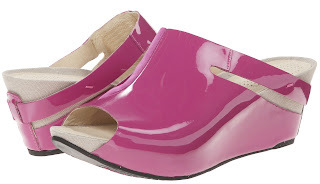 These open-toe slides boasts a patent leather and suede upper, a sleek architectural silhouette, an antimicrobial leather lined footbed, cushioned latex foam footbed for all-day comfort, a 2 1/2" leather wrapped wedge heel with 1 1/2" platform, and is available in seven amazing, including the above Dahlia patent. We love the ease of this style, especially with its incredible shape. Grab your favorite color (s) for only $59.99 each at 6pm.com.